Draw in the notebook and watch your design appear on screen. There's nothing like drawing straight into your notebook and feeling the bite of the pen on the page. However digital tools make it much easier to edit these rough ideas and refine them into a finished design. Migrating from page to screen can involve scanning and editing that eats into your time, but with the latest partnership between Moleskine and Adobe, that process just got easier. 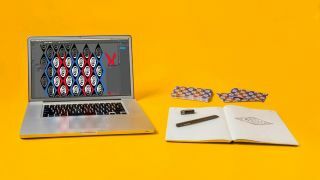 Meet the Paper Tablet, a new smart notebook from Moleskine that integrates with Adobe Illustrator. This snazzy notebook allows users to draw on the page and watch as their creations are recreated in Adobe Illustrator in real time. The Moleskine Paper Tablet - Creative Cloud Edition mirrors free-hand drawings with the help of the Moleskine Pen + Ellipse optical pen. Images drawn in the notebook are processed in Adobe Illustrator CC as a .JPG file before being converted into .SVG assets. Watch it in action with the video below. "The new notebook, combined with Moleskine Pen+ Ellipse optical pen, lets you seamlessly mirror free-hand drawings with pen and paper to Adobe Illustrator in real time," says Adobe's senior marketing manager Minson Chen over on the Adobe Blog. "This reimagined workflow transforms this creative process into a few simple steps and offers the most seamless analog-to-digital experience to date." And if you want to use your notebook without syncing to Adobe Illustrator, simply tap the "Illustrator" icon found on each page to pause the process. Perfect for giving your digital work an organic touch, the Paper Tablet looks set to streamline the workflow for creators in various disciplines.